In S1E4 of Continuum, we were told by the end that energy was cheap and plentiful, but water was at a premium (referring to the dry cleaning). If energy is cheap, cleaning water should be cheap and easy as well, right? Having relatively free energy will not remove the associated difficulties in acquiring water in the future even with desalination as an option. It will take concentrated efforts both at conservation, management and the application of technology to feed the growing demands of industrial societies worldwide. The show's acknowledgement of the fact is a testament to their goal of promoting some level of scientific acumen regarding the problems of Humanity's collective future. "Water is at a premium. All cleaning is dry-cleaning." At our current rate of water use, clean water is already a commodity in certain communities on Earth and the number of people is increasing at the same time the amount of fresh water becoming available is diminishing. Underground aquifers are not refilling as cities are preventing rainwater from returning to the Earth and instead is being redirected out to sea, ensuring wells and other freshwater supplies continue to diminish. While the number of storms may be increasing as global warming heats the planet, glaciers, snow and mountainous ice packs are not reforming which will ultimately ensure rivers and mountain-fed water supplies will eventually dry up. 39,000 gallons of water to produce a car and its four tires. 1850 gallons of water to create one barrel of crude oil. 13 gallons of water to produce one gallon of paint. It has been estimated that over 151,000,000 workstations have been produced this year (2009) so far, potentially 4,050,000,000,000, or 4 trillion gallons of water have been spent in the manufacturing process alone! With energy being easily available, it is possible and likely probable for desalination to become the primary means of acquiring water but there are several issues will become a problem with continued use. Salt water is filled with salt and other chemical runoff from factories. The processes required to heat the water to vaporization and then condensation again for drinking can be both time consuming and energy intensive. The byproducts of the process, salt, minerals and other chemical effluvia will need to be managed and stored. It should not be returned to the ocean for fear of disturbing the saline balance of the area and affecting local wildlife (assuming there is still any remaining). Other processes, such as osmotic pressure or reverse osmosis may get fresh water with less energy but are far less effective and require a great deal of space for the facilities. In addition to getting the water from the oceans comes the matter of moving it to places which are not along the ocean front. It could be assumed such water production will have to have a coordinated series of technologies for its distribution ensuring water loss in transit as well. Current pipeline technologies are known for their inefficiencies and water losses. The efforts needed to coordinate Earth's water supplies would be considerable and expensive possibly making it one of the most powerful and necessary agencies of 2077. Here is an article with references regarding our current state of water, its issues, its technologies and challenges for the future. No Blood for Water. Salt water is desalinated to produce fresh water suitable for human consumption or irrigation. One potential byproduct of desalination is salt. Desalination is used on many seagoing ships and submarines. Most of the modern interest in desalination is focused on developing cost-effective ways of providing fresh water for human use. Along with recycled wastewater, this is one of the few rainfall-independent water sources. 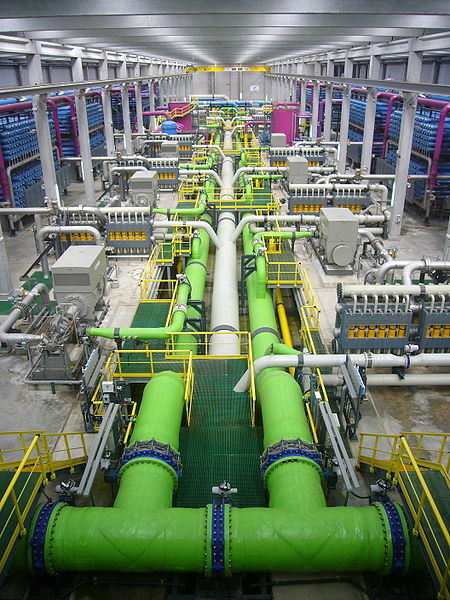 Large-scale desalination typically uses large amounts of energy and specialized, expensive infrastructure, making it more expensive than fresh water from conventional sources, such as rivers or groundwater. Basically all it costs is energy (even the infrastructure is little more than an energy problem to smelt iron and cement klinker and such). Not just cleaning the water becomes cheap, but as something that's liquid at normal temperatures, you can pipe it nearly everywhere except the most extreme arctic environments. I pointed it out in a comment, but I think it deserves its own answer. I think cause and effect are reversed in the question. "Cheap" and "expensive" are relative. Perhaps energy in the 2077 world is so cheap because society will make efficiency choices like this. If water is at a premium, and processing water for necessities and industry is quite expensive, energy-wise, and dry cleaning is more efficient, energy-wise, than washing clothes with water, then it makes sense to dry-clean clothes rather than wash them with water. Thus energy is kept more plentiful (and cheap) and water, a more valuable commodity, isn't wasted on some process that can happen without using it. because there are corporations in charge of the future government of 2077. And as we all know there are a number of bottled water companies and agents in the world. Namely a big company we can all identify with Soda. If the corporations have control of the government(s) then I can bet they have the interest of the Holy Dollar in mind. Also, with the rate the populations are growing, it would be easy to say there is polution that is being swept under the rug. While certain things are great like the things we currently in the 21st century have to pay a lot for being free by the 22ns century.....it wouldn't be too inane to believe that things we currently get for free or cheaply would be costly in the future. Though, I really want to blame to soda corporations becaus eof their bottle water franchises. That's just my stupid humor peeking out. I'll probably get down voted for this, since I haven't seen the show. The first thing that I can think of that would make water a premium item is that there isn't much water to be had. Yes, in our real world, 2/3 of the surface is covered with water that can easily be made potable with enough energy. But in the world of "Continuum", is the water even there to begin with? Not the answer you're looking for? Browse other questions tagged continuum .